It was a fantastically fun and busy weekend, but getting up this morning for work was brutal! After a busy and fun day Saturday of visiting the farm sanctuary, shopping, and eating out, I got up early Sunday to head out on a 5-mile training run for an upcoming 12k race and prepare food for a family birthday party while trying to catch up on house chores. I started to feel like the Tasmanian Devil whirling around like a tornado! 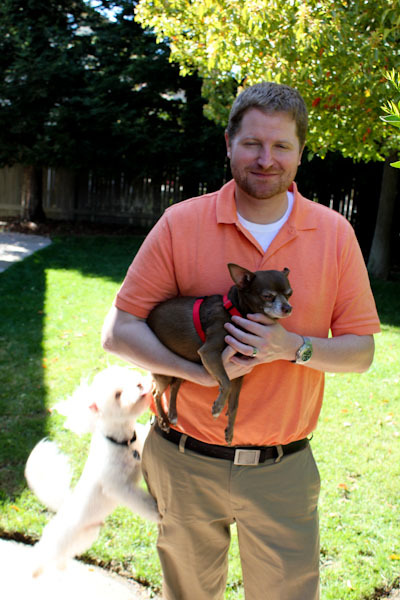 When we got to the party at my sister’s house, hubby got tasked with protecting my mom’s chihuahua from another visiting dog with raging hormones! The white fluffy poodle was determined to have his way with the chihuahua the entire evening, so we all took turns carrying the poor guy around. The party was catered by Lucille’s BBQ, so there wasn’t much for a vegan! 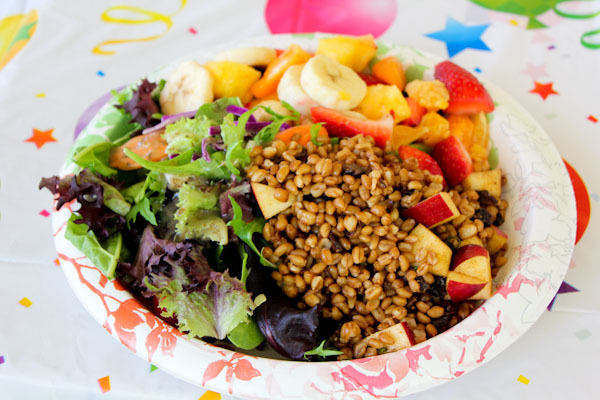 I brought a modified version of this Wheat Berry Salad recipe for a main dish and dived into the salad and fruit salad. 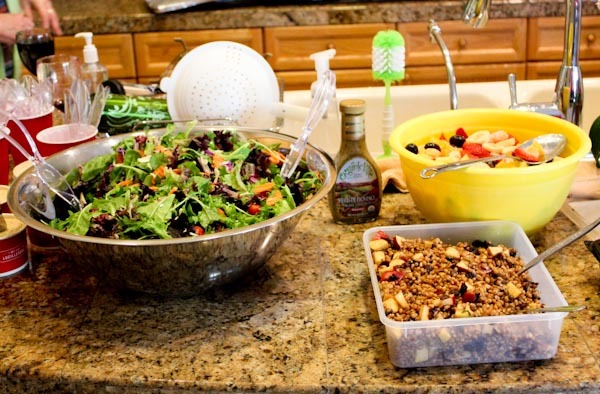 The salad was quick to throw together after cooking and cooling the wheat berries. And the cinnamon and apples made it seem more of a sweet summer treat than a hearty vegan main dish. And I had the most colorful plate at the party! Tonight I kept things simple for dinner after a hectic day at work. 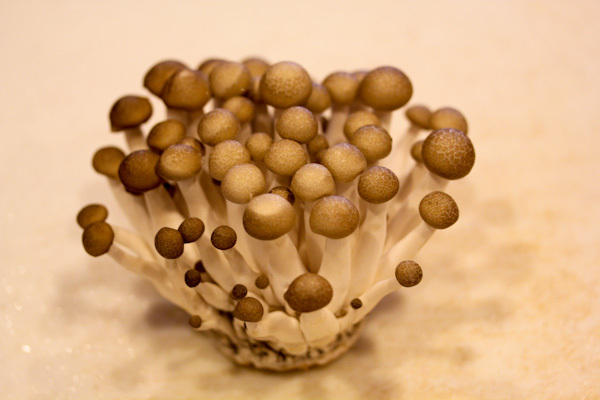 We received some brown beech mushrooms in last week’s farm box that I’ve been looking forward to trying. 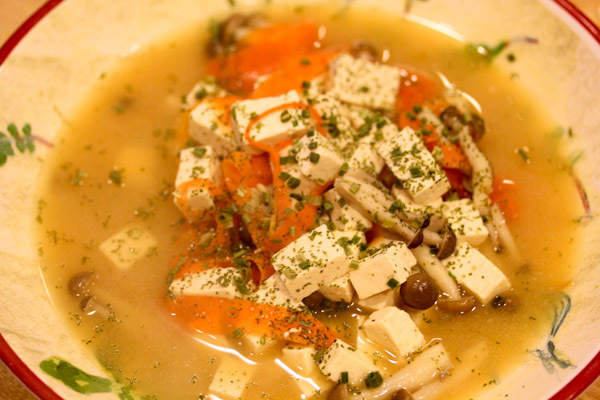 Because they reminded me of the mushroom miso soup I had in Napa, I decided to use them in Jennifer Cornbleet’s veggie ramen soup recipe. 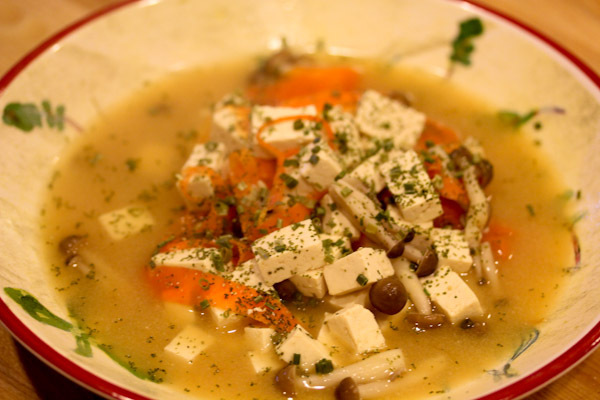 I also added chopped sprouted tofu to make it a hearty main soup. 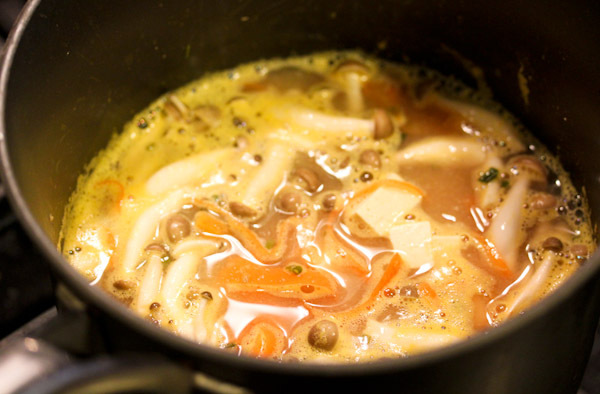 And the mushrooms added a gorgeous and elegant look to the soup. I have a love/hate relationship with mushrooms, I really adore them in some recipes and can’t stand them in others. The texture and flavor of cheaper mushrooms freak me out, especially when they’re overcooked. And I can rarely eat an entire portobello mushroom. But the delicate flavor and firm, non-slimy texture of these were wonderful! So wonderful that I could easily justify paying more for them at Whole Foods versus buying a cheaper variety. WOW! That salad looks great! Loved the story about the dogs! OMG! 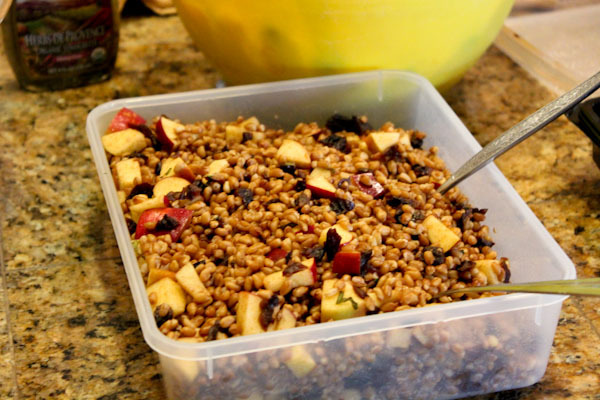 I will be doing something with Wheatberries in the future and I have to admit it will be a first for me! 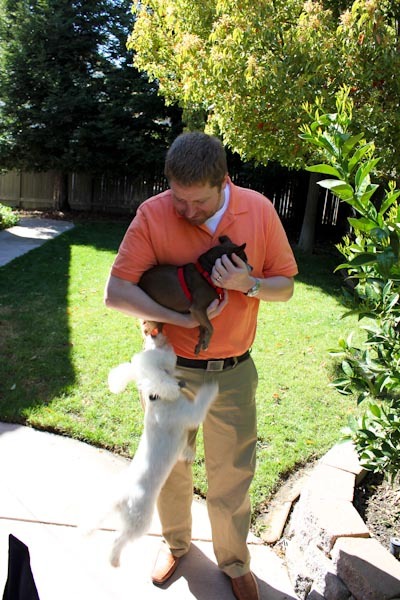 Thanks, things get a little crazy when we bring dogs to family parties. 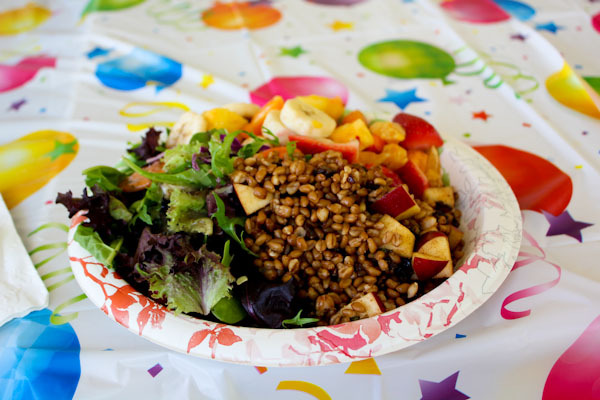 :-) That was my first time with wheat berries too and I was really impressed. I need to try sprouting and pressure cooking them next. I, too, have a love/hate relationship with mushrooms. Sometimes they’re good, but I feel like they’re in too many veg recipes, sometimes in places they’re not really welcome. Growing up, my mom used to cook canned mushrooms and they just filled the house with an awful smell that made my stomach turn. I couldn’t understand how she could eat those, ick!